On to the tutorial. Here is what we will be making today. I've shown my gold leather necklace and earrings in another post and the tutorial for the making the leather necklaces were published in an April post HERE, so I needed a pair of earrings to go with my silver. These are so easy and lightweight to wear. 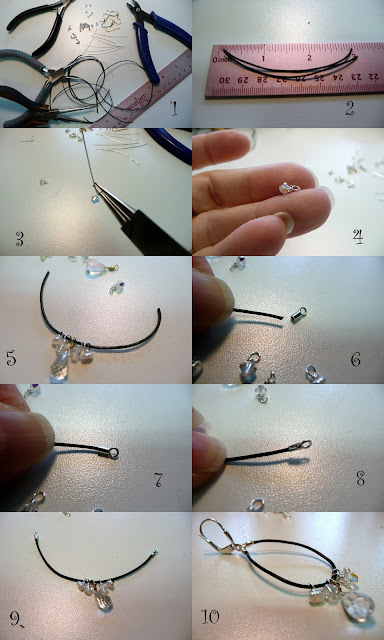 You don't even feel like you are wearing long earrings, although by making them yourself you can adjust the length. These are inspired by a pair of earrings out of the Sundance Catalog HERE. Add your earring finding by opening the loop at the bottom and inserting the crimp loops. Never pull a jump ring or finding directly apart from each other, always twist apart gently until you have just enough room to insert your loops. That's it, make your other earring to match or not....some of you may get really creative and I would love to see what you have done with these. Here is a picture of my completed gold and leather set, which by the way I am wearing today. Those are so pretty! And easy to follow tutorial. Great job!